Iakov Efimovich Fomin was born in 1885 in the Cossack hamlet of Rubezhnoe in Elenskaia stanitsa in the Upper Don district (stanitsas were the village units of the Cossacks, primary units in political and economic administration). 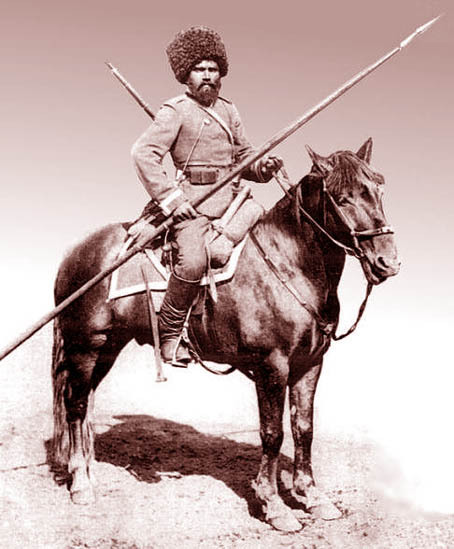 He served in an elite Don Cossack unit from 1906. He is described as being six feet tall with a red beard. After the revolution he returned to the Don region but was drafted into the Don Army of Ataman Krasnov, which was opposed to the new Bolshevik government. He led defecting units from the Don Army over to the Red forces in December 1918-January 1919 (Krasnov in his memoirs tells how he got on the phone to Fomin who answered him with “vulgar abuse”). This resulted in the defeat of Krasnov and the consolidation of Red Cossack units. As a unit commander in the Don Corps led by Filipp Mironov, he participated in the August 1919 mutiny at Saransk which ended with his and Mironov’s arrest by Maslakov (see the separate bio of Maslakov on libcom). Mironov had been moved there far from the Don and even further from the front against the White general Denikin. In response to the victories of the Denikinists the forces of Mironov, disobeying the orders of Trotsky and Budyenny, started to march to engage them in contact. For this Trotsky falsely and slanderously accused Mironov of seeking not to fight Denikin but to join him. Both Fomin and Mironov were sentenced to death, with Trotsky particularly keen on calling for their execution. However the Bolshevik government amnestied them both, supposedly for their past services to the revolution, but really for the need to win the support of the Cossacks. He then returned to service in the Red Army. It was as a commander of a cavalry squadron in the stanitsa of Veshenskaia in late 1920 that Fomin launched his mutiny, with the support of his captain Kapurin. Increasingly dissatisfied with the Bolshevik food requisitioning which directly effected the Cossack garrison and encouraged by the fighting among Upper Don district officials as to whether or not they should move grain to other districts, the squadron mutinied on March 13th, two weeks after a Bolshevik high-up ordered the moving of grain seed from the county raising the slogan of Down with the requisitioning! Down with non-local Communists! There was almost complete support of the population of Veshenskaia for the mutiny. It appears that Fomin was also inspired by news of the Kronstadt mutiny that had just broken out. The Communist Party cell of the garrison joined the mutiny as did one third of the Veshenskaia stanitsa Party cell. The Fomin unit was forced out of Veshenskaia and began a guerrilla struggle against the Bolshevik regime. They moved location every day, and held assemblies in every village they went through where Fomin and Kapurin said that the unit was fighting against the Communists but for Soviet power. Under increasing attacks from Red Army forces the Fomin unit was driven into Voronezh province. However it returned to Veshenskaia in autumn 1921, winning much support among the local population and increasing its strength through new recruits. On April 18th Fomin’s forces were surrounded by Red forces led by Yegor Zhuravlov and almost completely destroyed. Fomin managed to escape and started building up his units again. Bands of anarchist sailors joined the grouping, as did combatants from dispersed units of the previous Maslakov mutiny and the guerrilla unit of Korchukin, who had been involved in the previous mutiny against the Bolsheviks led by Vakulin and Popov. It defeated several Red Army detachments. It appealed to “citizen Cossacks and peasants, Red Army men in the front-line units of our glorious Red Army!”, and it condemned the mass terror tactics of the Bolsheviks calling on “citizens” to rise against them and establish "the true power of the whole labouring people”. Worried by the increasing support for the Fomin detachment, in November-December 1921 the Bolshevik leadership sent a special unit of the Don Cheka, a whole Red Army regiment and additional special detachments to the area. On the night of 13th to 14th June 1921 Korchukin was killed and his unit cut to shreds. The Red detachment led by Frolov finally caught up with Fomin and his combatants on the 18th March1922. Two days of fighting ensued. Fomin and his fighters were wiped out by the 20th. Fomin killed himself rather than be captured, or so the Bolsheviks claimed. Fomin features in Mikhail Sholokhov’s novel of the civil war The Don Flows Home to the Sea. Sholokhov, who knew Fomin personally, describes him as “an incorrigible woman chaser, a merry and sociable Cossack”. It should be borne in mind that the novel was written under the Stalin regime and so Sholokhov’s unfavourable descriptions of Fomin and Mironov should be considered in this light.